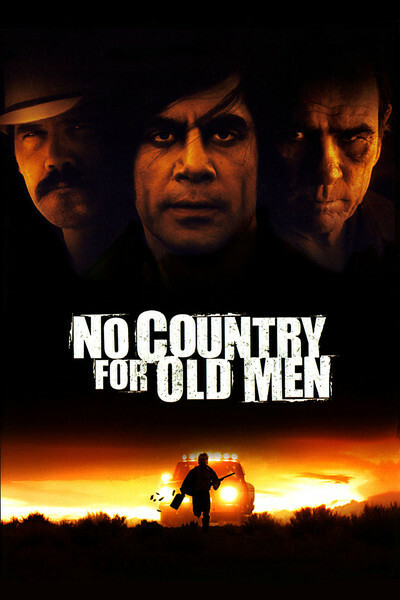 No Country For Old Men is a 2007 film directed by Joel and Ethan Coen. It was adapted by the Coen brothers from a highly regarded novel of the same name by Cormac McCarthy. I haven't read the book yet (it's high on my list), so I can't speak to how faithful to the novel the film is or isn't, but I can tell you what high regard I hold it in: I think it's the best movie the brothers have made so far (even better than Fargo and The Big Lebowski) and if I had to pick the best film of the 21st century so far, it'd be a toss-up between No Country For Old Men and Paul Thomas Anderson's There Will Be Blood (also released in 2007). What's so great about it? Well, to start with, there's the amazing cast. The setting, southwest Texas in 1980, is dramatic and beautifully filmed. The writing and the direction are top notch, and the suspense is intense and unrelenting. The three main characters all have depth and are all memorable. Add to that an enigmatic ending that many found anti-climactic (and which I loved) and you've got a recipe for a pretty tasty movie. Llewelyn Moss (played by Josh Brolin), a Vietnam veteran who is out hunting antelope when he witnesses a drug deal gone bad. Things get very interesting very quickly. Anton Chirugh (Javier Bardem in an Academy Award winning performance) is perhaps the most purely evil character in movie history. Enough said for now. Sheriff Ed Tom Bell (Tommy Lee Jones) is an aging law enforcement officer about to retire who thought he'd seen it all. All three actors are outstanding. For Jones, it's a role he's mastered and played plenty of times before, although here he adds a sense of sadness that is palpable and powerful. Bardem's performance is incredible, already legendary. He looks, speaks and behaves like nothing we've ever seen before, and he's always one step ahead of everyone else. While Bardem's Chirugh is the character everyone talks about, that everyone remembers, it's Brolin's performance that's the glue that holds the movie together. He's persistent, resourceful, and way over-matched, but he keeps on as long as he can. He's heroic and naive and stubborn and greedy and smart and stupid, often all at the same time. The fourth major character would be the harsh landscape that serves as the setting. The scrub brush prairies and deserts are as harsh and brutal as the other characters, but they are also filled with an existential beauty. Just like the snow-covered terrain that was such an important part of Fargo, the Coens demonstrate an affinity for emptiness, for expansive horizons and big skies. No Country For Old Men is one of the most atmospheric and suspenseful movies ever made. Like most Coen brothers films, there's a lot going on, and it all works, even that enigmatic ending. Above all, the Coen brothers are great storytellers. If you haven't seen the film yet, you might want to stop here. If you have, and you've wondered what's up with the ending, and what was it all about, well, let me take a whack at it. Clue number one: The title. Understanding why a film is named what it is is always a good starting point. In this case, I think it gives us everything we need to know to appreciate the ending and understand what the entire film is about. The title is taken from the opening line to a poem by William Butler Yeats, "Sailing to Byzantium." The poem is about how as one ages, one needs to reject the physical and sensual world and accept entry into the spiritual, the eternal worlds. Remember this, because it explains everything, especially the ending. Clue number two: The three main characters are only seen one at a time. Llewelyn Moss (Josh Brolin), Anton Chirugh (Javier Bardem), and Sheriff Ed Tom Bell (Tommy Lee Jones) are never seen in the same frame, never share the screen. It's not just that all three of them are never in the same frame; no combination of any two of the three are ever together. The closest is near the end, when Bell enters the Hotel Room crime scene, and Chirugh is on the other side of the door. The open door obscures Chirugh, so even when they are in the same room, only one is visible. Why is this important? I think it's the Coens telling us that the three characters share common attributes and that they are metaphorically the same, all three being parts of a larger whole. They can't share the same space because when you see one, you see all three. Gene Jones as "Gas Station Proprietor"
Both Chirugh and Sheriff Bell are bound by and remain faithful to their own set of rules. We see this repeatedly with Chirugh and the coin toss with the store keeper, and later, the bounty hunter Carson Wells (Woody Harrelson). Chirugh is bound by the results of the coin toss--he doesn't kill the storekeeper when he guesses correctly, and he does kill Wells when he guesses incorrectly. He says, more than once, "If the rule you follow brought you to this, of what use was the rule?" Useful or not, Chirugh is bound by rules, and therefore lacks free will. Sheriff Bell also obeys rules--not just the laws he is sworn to uphold, but also the mythic western code of the landscape, of cowboys, of simpler times. He believes in traditional values, and in a scene near the end of the film, while visiting with his Uncle Ellis, a retired sheriff, he blames the madness he's witnessed on the erosion of these values. Ellis points out that the region has always been violent, pointing to a brutal murder in 1909 as evidence. The rules both men are forced to follow reveal a lack of free will, and they also speak to the randomness of fate. In Chirugh's case, his victims' fates come down to the results of a coin toss. In Bell's case, many of the rules he follows are really only values, and have no inherent strength of their own. At the end of the film, he seems depressed, as if he'd answered the question Chirugh posed to his victims: If the rule you follow brought you to this, of what use was the rule? The rules the Sheriff followed brought him to Chirugh, who is a nightmare for him. Llewelyn Moss is the only one of the three that doesn't follow any rules. He snubs the rule of law that Sheriff Bell embraces, and he also defies Chirugh. He has free will, but he still ends up dead. His wife, when confronted by Chirugh and his coin toss, refuses to participate, opting to die rather than sacrifice her own free will. So what do we make of these rules? I think it illustrates that the sheriff and Chirugh both lack free will, but in the end are still alive while the Mosses are not. After Chirugh kills the Mosses, he is struck by a car that blows a red light and nearly kills him. This might be seen as an act of karma, as punishment for killing the free, but Chirugh proves again to be too strong and ends up walking away from the accident. His belief in the rules he follows, twisted as they may be, is so strong as to make him into a Superman (Nietzsche? ), indestructible and immune to random fate. Clue number four: The hunter becomes the hunted. The movie begins with Moss hunting prong-horned antelope and, after witnessing a drug deal gone bad, he quickly becomes the hunted. Chirugh hunts Moss and is hunted by Bell. Bell is hunted by an invisible force: time. About to retire, he is hunted and haunted by the events unfolding before him. These shared experiences are further linking of the three and evidence of them being parts of a disparate whole. Clue number five: Two scenes that illustrate the bond shared by Chirugh and Sheriff Bell. The first of these occurs in Moss's trailer, when Bell, hot on the trail of Chirugh, arrives just minutes after Chirugh left. There's a glass of milk on the table that Chirugh left behind and it's still cold. Bell drinks from it, thus reinforcing my three are really one theory in that all drank from the same milk (Mother's milk? Hmm...). Bell sits on the couch in exactly the same spot Chirugh sat, and sees his own reflection in the television, just as Chirugh saw his. This illustrates that Chirugh and the Sheriff are different aspects of the same being. The second scene is in the hotel crime scene, when Bell enters, unaware that Chirugh is behind the door. There is a shot of the two men's shadows that seem to overlay each other as the door opens until the two shadows become one. Clue number six: The sheriff's dream. Tommy Lee Jones as "Sheriff Ed Tom Bell"
The movie ends with Bell, now retired, sitting at breakfast with his wife, telling her about a dream he'd had. In the dream, he and his dead father were riding on horseback in cold darkness, and his father went ahead to light a fire in the darkness, where he'd wait for the sheriff. The film ends here, fulfilling Yeats' vision that the aged need to accept entry into the non-physical, spiritual world of eternity. Bell is completing an entry that began just before Moss's murder. Clue number seven: Moss's murder isn't shown. With the entire movie seemingly building up to a final Chirugh and Moss conflict, instead we are shown only the aftermath of Moss's murder. This is because of the rules the filmmakers imposed upon themselves (not to show any two of the characters in the same frame), and because the final act, which begins at this point, is about the entry into the spiritual world and the abandoning of the physical world of death and violence. In the scope of this, the murder of Moss and his wife isn't important; it's part of a world that is being left behind. So what does this all add up to? I'm not sure. There is no denying the inherent nihilism in the randomness and brutality of the unrepentant violence in the film, despite the presence of rules or the existence or non-existence of free will. The sheriff's dream, about being reunited with his father in another world, would seem to suggest a paradise, except that his father will need to start a fire so he can see in the cold darkness. This doesn't sound like the brightly lit paradise that heaven is normally depicted as (although being reunited with his father in the landscape he loves might seem like paradise to Bell). The idea of the three main characters being a part of one makes me think of the three elemental attributes associated with human beings: body, spirit and soul. If this was what they represented, then Chirugh would have to be body, because he dwells only in Yeats' physical world; Moss would be spirit, for he has elements of both of the other two yet he is the first to pass--the body and the soul will both outlast the spirit. Finally, Bell is the soul, as he has gained admission into the eternal world, leaving the spirit-less and soul-less body alone to perpetuate its evil in the physical world, in the region that is no country for old men. So--that's my interpretation. I'd love to hear your comments, what parts you agree or disagree with. I love films that make me think, and I know I'll still be thinking about No Country For Old Men for a long time, and that I'll collect even more clues the next time I see it.